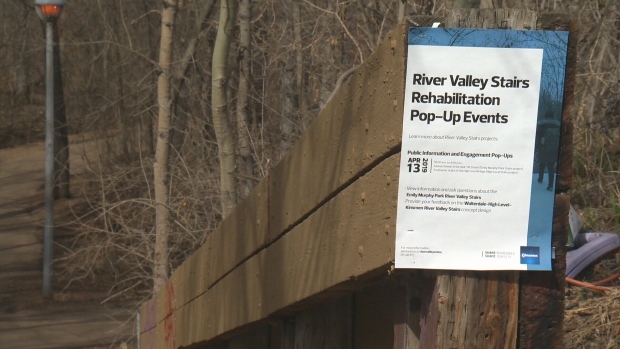 The city has started or scheduled rehabilitation work for five sets of stairs in Edmonton's river valley. The city is making improvements to the river valley stair system. Five of the city’s 50 sets of stairs are slated for or are already seeing renewal work: Emily Murphy, Grandview Heights, Highlands, Jackson Heights and Walterdale-High Level-Kinsmen Stairs. The city is in the middle of several public engagement sessions to discuss their plans. Speaking at the Walterdale-High Level-Kinsmen Stairs on Saturday, stair-runner Kory Mathewson said the location was one of the worst sets in the city. “Seeing something like this fixed up gives me something that I can tell people, ‘There’s Whyte Avenue right there, you can walk down 109 and there’s a straight shot right to the river, which I think is the gem of Edmonton,” Mathewson said. Construction at the stairs is expected to be completed by spring of 2020.